As it was our testing week this past week, I tried to keep our activities light and fun. However, I am starting to stress about getting it all in before the end of the year. The key to this will be integration! 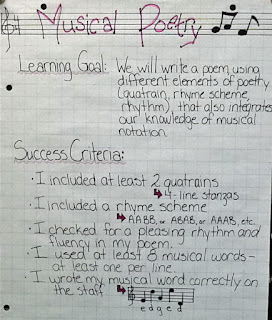 We made great little musical note poems this week to integrate our poetry writing with our music unit. The students had a lot of fun with them, and they turned out beautiful! I can't wait to make a fabulous display out of them when all the students have finished. 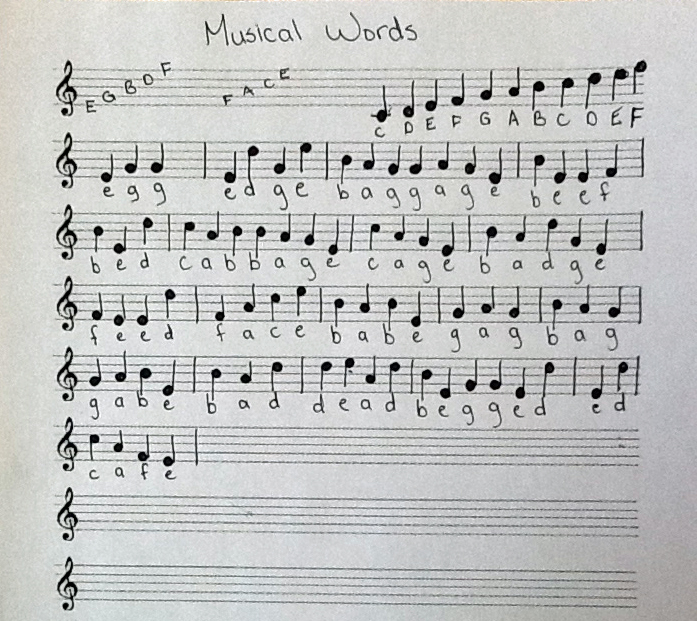 My students were already pretty good at identifying notes on the staff, so after a quick review, I let them work in pairs to create as many "musical" words as they could - using the letters from the music notes: C, D, E, F, G, A, B. They also had to write the notes for all of the words they found. This picture shows just some of the words the students found. This was our anchor chart showing our learning goal and success criteria. 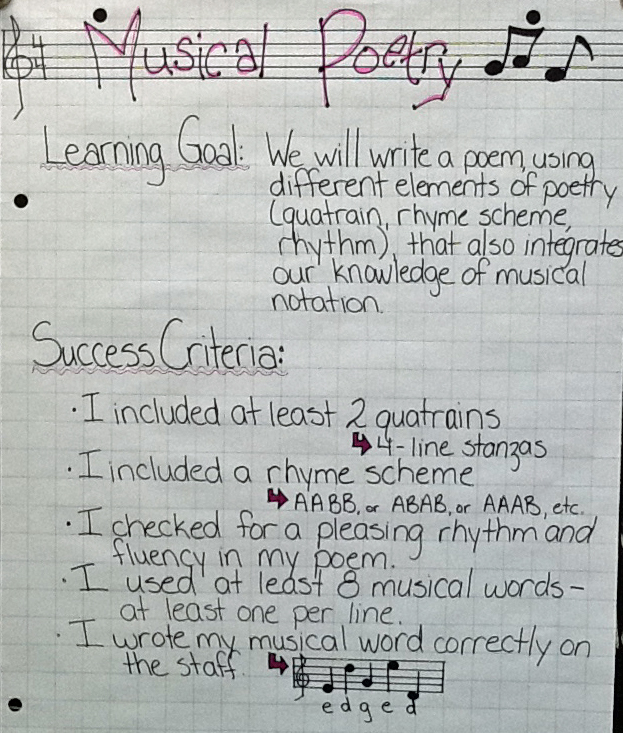 Students needed to write a poem that had at least 2 quatrains, a rhyme scheme of their choice, and a pleasing rhythm. 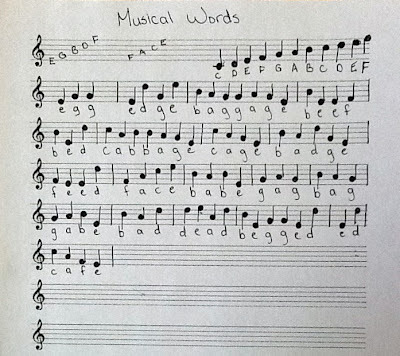 They needed to include at least 8 "musical words" - one per line. 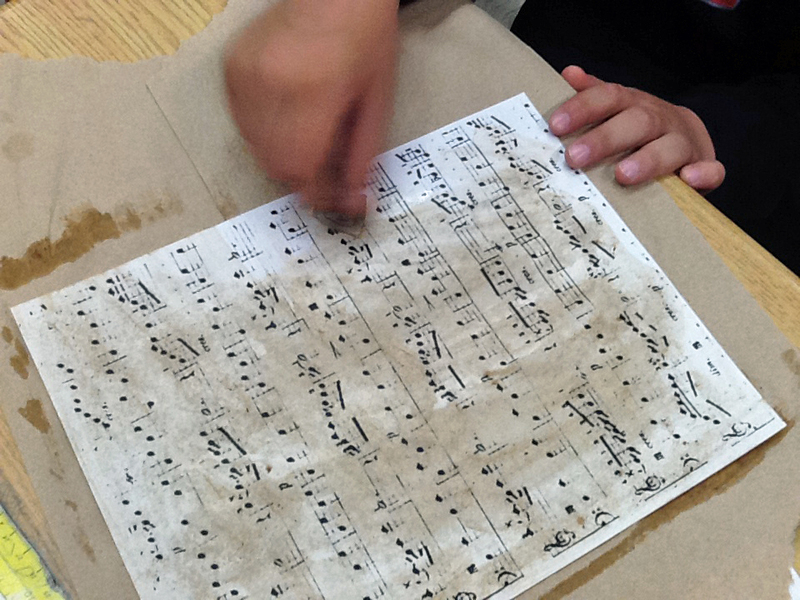 I printed off an image of sheet music I found, and we used tea bags to give the sheet music an antique look. This was used for our background frame to mount our poems on. Happy Saturday! It's a dreary one here, but I'm excited to get to some baking with the rhubarb from my garden. I think there's a strawberry rhubarb crumble in our future tonight! My students are learning to read music this year. What a great idea! Absolutely love this idea. I teach band and language arts, but never put the two together with poetry. Thanks so much for the inspiration. Love this idea, Jen. I'm always impressed with how you incorporate the arts in your curriculum. Jen, this is such a great activity!!! 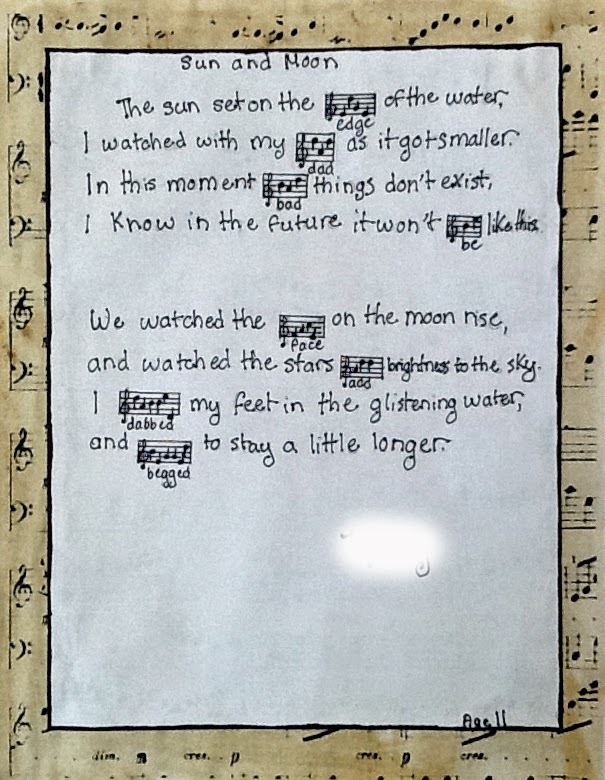 I'm so jealous of your ability to integrate music & art into the curriculum! You have a gift my friend! Your kids will ACE that test! Hi, I'm your newest follower! It's so rare to find other Canadian bloggers. Check out my blog, I'm trying to collect Canadian teaching resources in a linky party. I just discovered this now and had to laugh. I do this also! It's a whole lot of fun--kids do love it! btw my Canadian better half says hello :-) We were just up there. LOVE your blog! 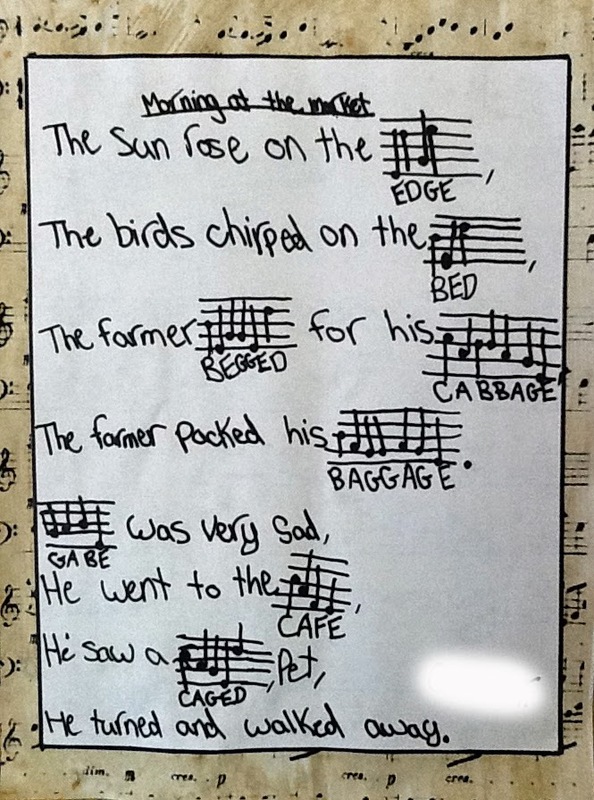 This is great lesson, and I have used a similar format in my music room. The student examples are good. Make sure to emphasize musical accuracy, however with the little staves. The second example includes the treble clefs, but the first one does not. This is an important detail. Thanks, and I look forward to more lesson ideas!